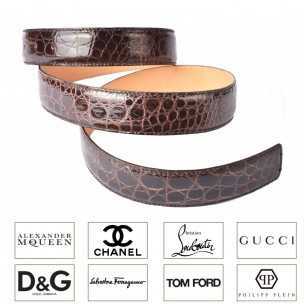 Our fully customizable leather belt straps are handmade by our master craftsmen with the utmost care and precision. These handcrafted straps are made to fit your precious GUCCI buckles. Being able to constantly switch out your belt strap gives you the option to adjust the look of your belt to suit every occasion. Casanova1948 will help you personalize every aspect (type of leather, color, waist, width, stitching) to make the belt uniquely yours, and our craftsmen will insure the highest of quality in its realization. Each of our exquisite leather skins is hand chosen and has its own distinct patterns and designs, making each piece a truly unique work of art. With the patience and expertise of a fine artist, our master craftsmen pull from over 50 years of personal experience to create timeless product tailored to your style.